Opinion: Satanic Display Shows Power Of The Bible NPR's Scott Simon reflects on The Satanic Temple display in the Illinois State Capitol. Andrea Mantegna's Madonna della Vittoria, housed in the Louvre in Paris, includes a depiction of Adam, Eve and those tempting apples. There's a Satanic display in the Illinois State Capitol in Springfield this holiday season, near a Nativity scene and a menorah. It shows an arm, encircled by a serpent, winding up to a hand holding an apple, and below is an inscription: "KNOWLEDGE IS THE GREATEST GIFT." A spokesperson for The Satanic Temple of Chicago, which sponsors the display, says the art piece called Snaketivity is inspired by the biblical Garden of Eden, where a serpent sent by Satan tempts Eve with an apple from a Tree of Knowledge of Good and Evil. 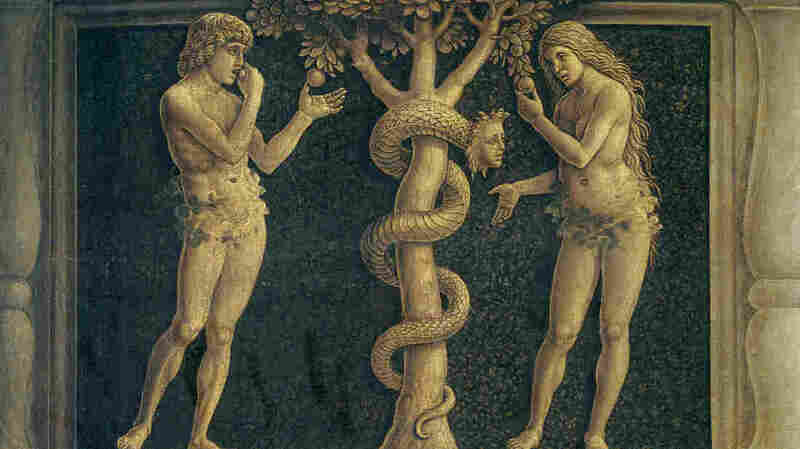 Eve bites the apple and shares it with Adam. "We see Satan as the hero in this story," says the temple spokesperson, "because he gave Eve the gift of knowledge." Four of the last 10 governors and dozens of other public officials in Illinois have been convicted of public corruption. Temptation and Satan would seem already well-represented in Springfield, though I've never known an Illinois politician who could be bought for just an apple. The office of the Illinois secretary of state explains that the First Amendment guarantees the right of The Satanic Temple to mount this display. Atheist groups have provided exhibits across the country in past holiday seasons. But a display by a group that calls itself The Satanic Temple has brought about a new round of public attention. Yet, a few clicks into its website will disclose that The Satanic Temple is not truly Satan worshippers. It says it is a "non-theistic religious organization" that seeks to "encourage benevolence and empathy among all people," which sounds almost discouragingly humanitarian. The temple seems to take the name of Satan as a brand to make the point — as it puts it — among its tenets that, "The freedoms of others should be respected, including the freedom to offend." It's irresistible to note that a group that says it does not believe in God still expresses its beliefs with an image from the Book of Genesis. You don't have to believe the Bible is literally true to see that it is powerful literature. It may have been written — as Christopher Hitchens memorably phrased it — in "the bawling and fearful infancy of our species," but the Bible endures as beguiling, inspiring and insightful stories about children, parents, kings, queens, loss, triumphs, floods, flames and everlasting lights, heroes with fatal flaws and villains with human faces. Satan wouldn't be a household name without the Bible. In the audio version of this story, Bob Wills and His Texas Playboys is mistakenly identified as Bob Wills, His Texas Cowboys. Because of incorrect information from Getty Images, a previous caption with this story incorrectly identified the artist as Mantegna Andrea and implied the image was of a painting of the Temptation of Adam and Eve. In fact, the artist was Andrea Mantegna and the image is a detail of his Madonna della Vittoria. In addition, the audio, as did an earlier Web version, refers to the Tree of Knowledge; its full name is the Tree of Knowledge of Good and Evil.